Available every Saturday 12pm-4pm, our Beery Lunch is the perfect start to the weekend for any discerning beer lover. 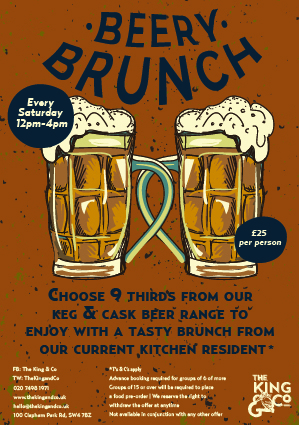 Just choose 9 thirds (three pints) from our extensive keg & cask beer selection to enjoy alongside a tasty brunch from our current kitchen resident for just £25 per person. Simple! Please get in touch if you’s like to book a table.